Last month, we introduced policy summaries to make it easier for you to understand the permissions in your AWS Identity and Access Management (IAM) policies. On Thursday, May 25, I announced three new features that have been added to policy summaries and reviewed resource summaries. Yesterday, I reviewed the benefits of being able to view services and actions that are implicitly denied by a policy. Today, I demonstrate how policy summaries make it easier for you to detect potential typos in your policies by showing you unrecognized services and actions. In this post, I show how this new feature can help you detect and fix potential typos in your policies. You can now use policy summaries to see unrecognized services and actions. One key benefit of this feature is that it helps you find possible typos in a policy. 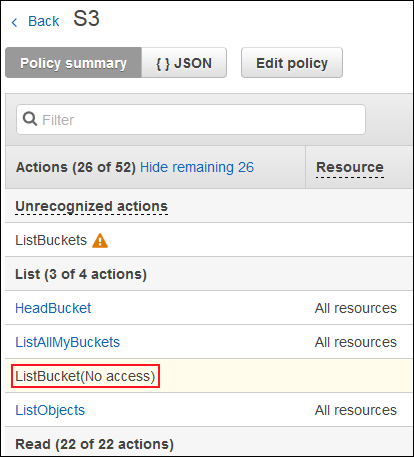 Let’s say your developer, Bob, creates a policy granting full List and Read permissions to some Amazon S3 buckets and full access to Amazon DynamoDB. Unfortunately, when testing the policy, Bob sees “Access denied” messages when he tries to use those services. To troubleshoot, Bob returns to the IAM console to review the policy summary. Bob sees that he inadvertently misspelled “DynamoDB” as “DynamoBD” (reversing the position of the last two letters) in the policy and notices that he does not have all of the list permissions for S3. 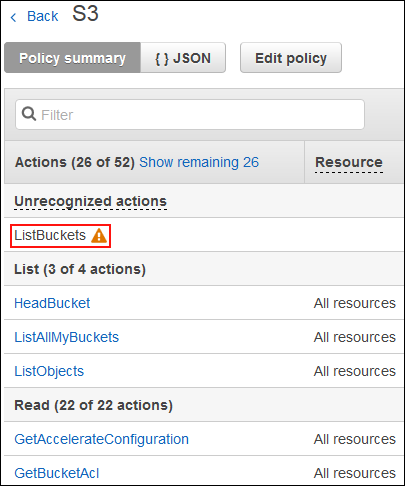 When Bob chooses S3, he sees that ListBuckets is an unrecognized action, as shown in the following screenshot. Bob chooses Show remaining 26 and realizes the correct action is s3:ListBucket and not s3:ListBuckets. He also confirms this by looking at the list of actions for S3. Bob fixes the mistakes by choosing the Edit policy button, making the necessary updates, and saving the changes. He returns to the policy summary and sees that the policy no longer has unrecognized services and actions. If you have a service or action that appears in the Unrecognized services or Unrecognized actions section of the policy summary, it may be because the service is in preview mode. If you think a service or action should be recognized, please submit feedback by choosing the Feedback link located in the bottom left corner of the IAM console. Policy summaries make it easier to troubleshoot possible errors in policies. The newest updates I have explored this week on the AWS Security Blog make it easy to understand the resources defined in a policy, show the services and actions that are implicitly denied by a policy, and help you troubleshoot possible typos in a policy. To see policy summaries in your AWS account, sign in to the IAM console and navigate to any policy on the Policies page of the IAM console or the Permissions tab on a user’s page.